It seems that time travelers may come pay respects to the late, great Stephen Hawking. Organizers have arranged a memorial service for the theoretical physicist, who died in March at the age of 76. Those who wish to honor him can apply for the event, slated for June 15, via a public ballot, the BBC reports. Applicants are mandated to give their birth dates, which can be any day until December 31, 2038. Hawking’s foundation said that the possibility of time travel has not yet been disproven, so it cannot be excluded. London travel blogger IanVisits noticed that due to the phrasing of the memorial service invitation, those born between 2019 to 2038 can then theoretically be allowed to go to the memorial, which is set to take place at Westminster Abbey. 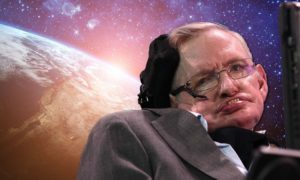 People from as far as China, Bolivia and the South Pacific have joined the ballot for the event, which will celebrate the life, work and genius of Hawking.